Preheat the oven to 300 degrees F (150 degrees C). Grease cookie sheets. In a large bowl, stir together the cheese, oil, beef broth and garlic. Combine the whole wheat flour, all purpose flour, cornmeal and powdered milk; stir into the cheese mixture until well blended. You may need to use your hand to properly blend the dough. On a lightly floured surface, roll the dough out to 1/4 inch thickness. 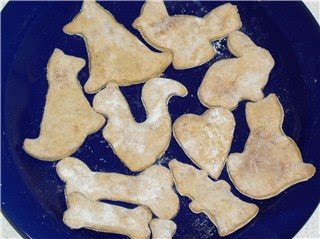 Use a bone shaped cookie cutter to cut out the treats. Place them onto the prepared baking sheet 1 1/2 inches apart. Bake for 20 to 25 minutes in the preheated oven, until the treats are firm and the bottoms are lightly browned. Cool on wire racks.